Differing widths of American key wind cans. 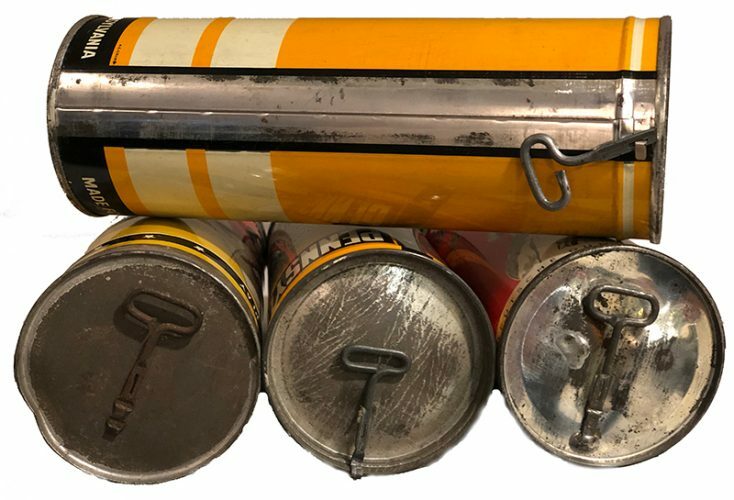 Starting with the flat lid American cans, you may have noticed that there are 3 different thickness of the metal strips where you insert the key to open a can. The oldest American cans had the thickest (3/8″) strips and will be slightly shorter than newer flat lid cans after removing the lids. The mid sized strip (1/4″) has only been seen on the olive drab cans from around 1945, a certain red and white Wright & Ditson can, and a Dunlop can with the new Maxlife Felt Cover (notify us if you know of any different cans). The thin (3/16″) strip appeared around the same time as the mid sized one, and was used until the manufacturers changed to the “pull-tab” method of opening cans. Top can – key attached to key-wind strip. Bottom left can- key soldered to bottom of a can from England. Middle can – key crimped to top of American can, last image – key soldered on bottom. On the domed lid Type 5 American cans, the key location will help determine it’s age. Around 1953 some companies such as Wilson & MacGregor began mounting the keys on the bottom of the cans instead of the top or side. It probably took several years for all cans to have the keys located on the bottom. Usually (but not always) a can with the key mounted on the side will be older than one with the key mounted on the top. It’s not uncommon to find two similar cans that have different key locations and / or opening styles. After all, the common metal yellow & red Wilson Championship container was made (with slight variations) for over 30 years. It has been around since about 1952 and was still in the product line in 1984 when Wilson introduced the first plastic tubes. 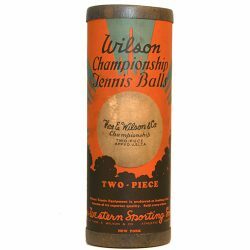 Wilson originated the cardboard tube in 1926, but only used it for a year or two until the advent of pressurized metal cans. Cardboard cans resurfaced during the World War II era when most metals were used for the war effort. Many cans have patent numbers that are helpful, but sometimes misleading. Magazine ads are the best way I know to date cans if you have access to older issues. Cans with the ridges in them, are older than those without. Some cans with ridges were made until at least 1957. Disc lid or snap cap cans are from 1949 and a few years after. One thing we like about disc lid cans is that the lid which usually matches the design of the can. Most or all disc lid cans have the British patent #627332 on them. This patent was applied for on Feb. 7, 1947 and accepted on Aug. 8, 1949. English Flat Lid cans are much harder date as they were made from 1958 through sometime in the mid 1970s. Old ads from catalogs and brochures are very helpful in pinpointing dates. Sometimes information on the container itself can provide clues as to its date. ZIP Code, for example began on July 1, 1963. It was several years before ZIP Code was fully implemented, so United States containers without the Code would be from somewhere before or around 1963-67. The ball specifications also provide clues at to their age. Balls marked “U.S.N.L.T.A.” would be from 1920 or earlier. U.S.L.T.A. 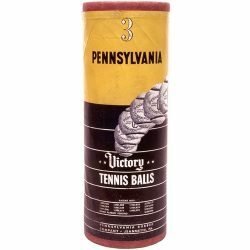 noted balls would be from the 1920 through 1975 era, and items marked “U.S.T.A.” Would be from sometime in 1975 and later. Special thanks to Larry Whitaker for the information on this page.